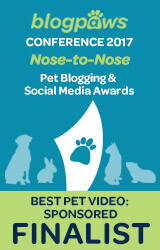 As a pet parent, it's nice to win pet products in giveaways and get free samples too. It allows us to save money and try something new before we purchase a full-sized product in the future. 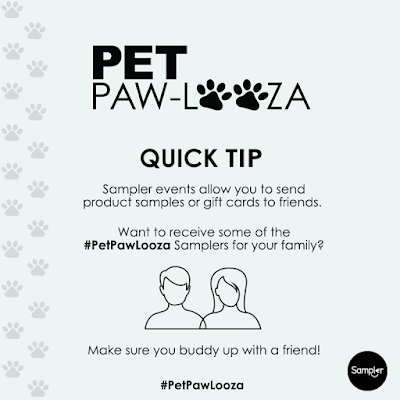 I'm excited to announce my participation in the Pet Paw-Looza Sampling Event hosted by Sampler! Pet Paw-Looza takes place Monday May 25th - Thursday May 28th. So what is this amazing Pet Paw-Looza Sampling Event? All week long, Pawsitively Pets along with several other awesome pet bloggers will be sharing flash giveaways on Facebook. There will be an opportunity to win a huge gift basket of pet goodies from the sponsors of Pet Paw-Looza. Plus, you'll be able to send and receive free samples of pet products to friends! 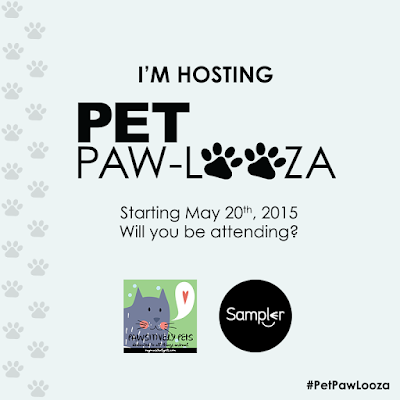 Your first step to participating in Sampler's Pet Paw-Looza Event is to RSVP. When you RSVP to Pet Paw-Looza, you will be entered to win the gift basket of goodies from all of the event sponsors. Also, you'll gain exclusive access to the events calendar which will tell you when the flash giveaways on Facebook are going to happen and where. You'll gain access to the schedule of sampling events from the brand sponsors too. You can click here to RSVP. Registration opens on Wednesday, May 20th, at 9 am EST. Sampling Events - Wish For It! After you RSVP, you'll be able to see the schedule of when and where these sampling events will take place. You'll have a better chance at getting the free samples as soon as the event goes live on the Sampler App. Free samples are expected to go fast! It's recommended that you pair up with a buddy for Pet Paw-Looza. With Sampler, you can only send free products to friends and you cannot claim them for yourself. Having a buddy ahead of time will allow both of you to get free samples from the sponsors. After you RSVP, you'll be able to "wish for" the sample offers from the sponsors. By wishing for a product, you are letting your friends know what samples you'd like to receive! 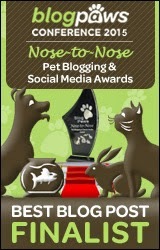 Flash giveaways will be happening on the Facebook Pages of the Pet Bloggers participating in Pet Paw-Looza. These giveaways will not last long and to make sure you don't miss any of them, be sure to RSVP so you can see the event schedule. Want to know which brands are sponsoring the Pet Paw-Looza Sampling Event? We received some samples to try out that are featured below. Make sure to click over and follow them all on Facebook ahead of time to be prepared for Pet Paw-Looza. Shiner has never tried Riley's Organics Dog Treats before, but I've heard they are amazing treats. They smell delicious and Shiner thinks they taste yummy. 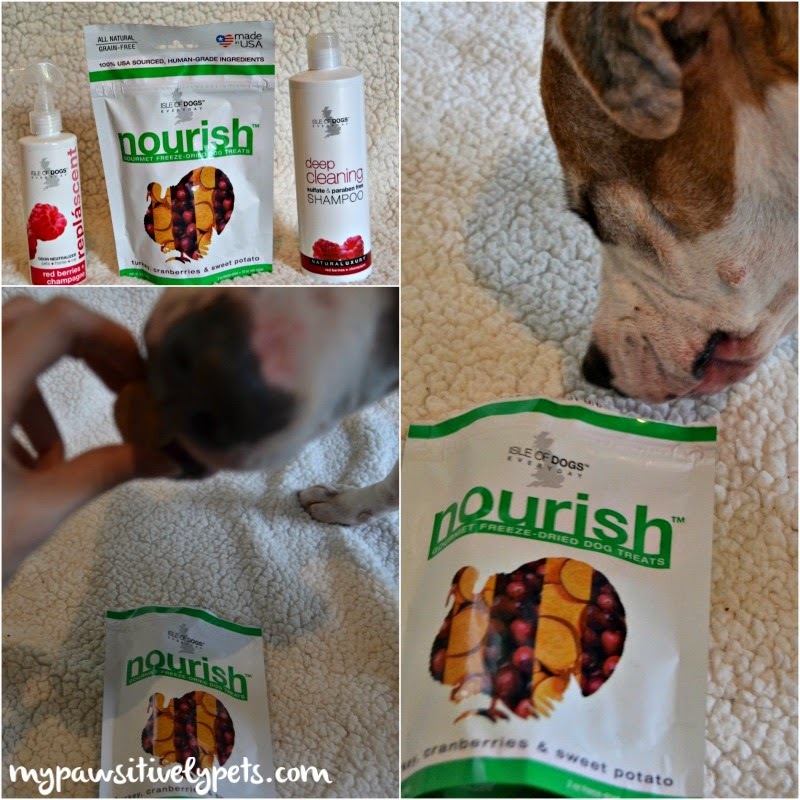 They are made with all-natural and organic ingredients, so you can feel good about giving them to your dog. Also of note - my rats love them too! We received a couple of different products from Isle of Dogs including shampoo, freeze-dried treats, and a bottle of odor spray. The treats are really nice and Shiner loves them, of course. I am loving the odor spray myself. It's like perfume for dogs and it smells amazing! 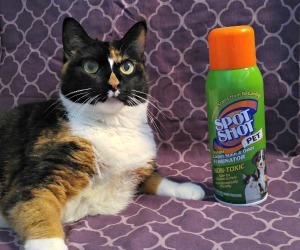 I actually have used Unique Natural Products Pet Odor and Stain Eliminator before and still have some left. It works well and smells nice too. Their products are made in the USA and safe for use in homes with pets. 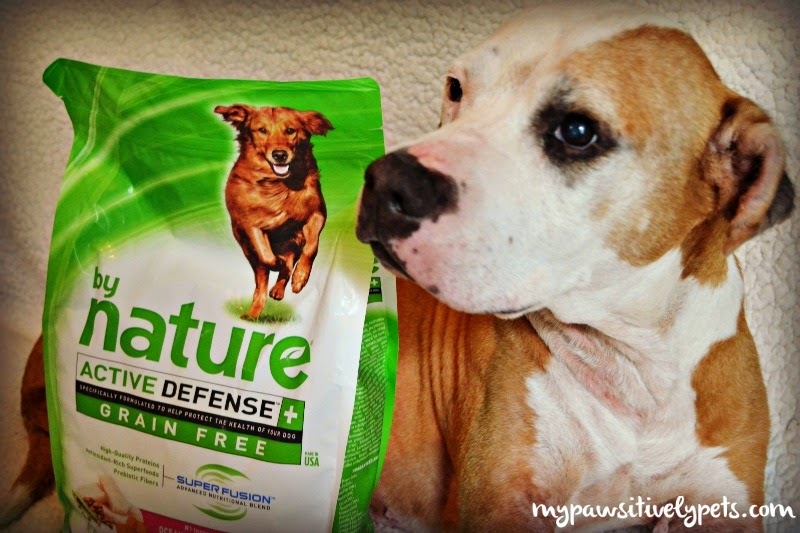 By Nature sent us a bag of their Active Defense Grain Free Dog Food and Shiner obviously cannot wait for me to open it up! This pet food company is new to us, but the food looks wonderful. The food they sent us is made in the USA and the first ingredient is real deboned fish. 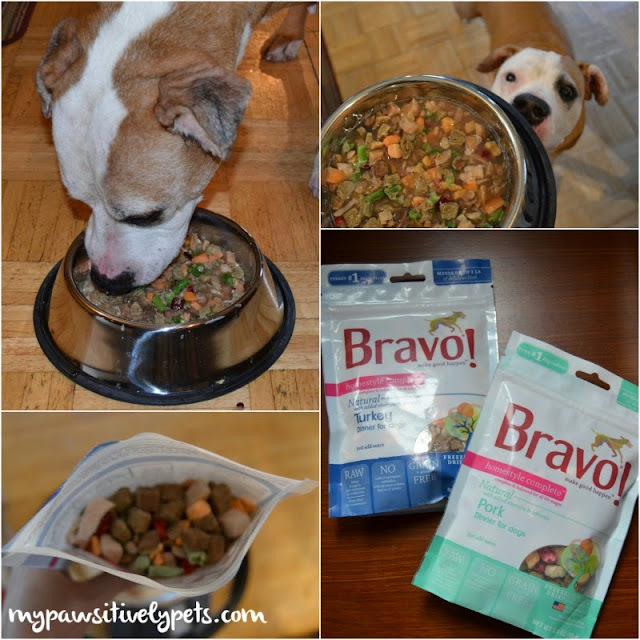 Also another food we haven't tried yet, Bravo Pet Foods sent over some of their Homestyle Complete Dinners for dogs. This is a dehydrated raw food that you just add water to. After adding the water and re-hydrating the food, it smelled amazing just like I had cooked dinner! Shiner loves it! Northern Pet Products sent Shiner some of their Bark! Pumpkin Recipe Dental Chews. These chews smell very tasty and I had to take a little nibble myself, I'll admit. They are very chewy and Shiner enjoyed nomming on hers for a few minutes. 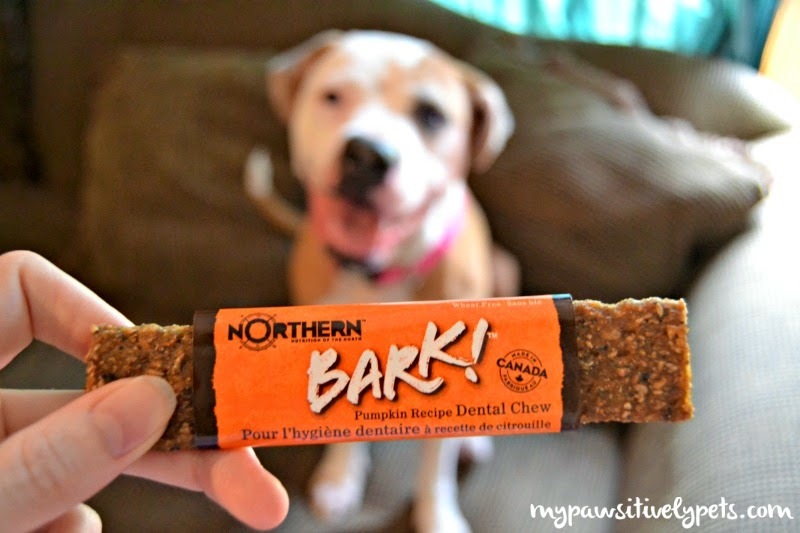 Northern Pet Products is a Canadian company that sources fresh ingredients from local growers. We can't wait for Pet Paw-Looza to begin on Monday May 25th so that all of you have can try these amazing pet products too! Mark your calendars and don't forget to RSVP now! Find a buddy and wish for the products you want to try. Which products are you most excited about sampling during Pet Paw-Looza? This post is sponsored by Sampler. We are being compensated to help spread the word about Pet Paw-Looza, but Pawsitively Pets only shares information we feel is relevant to our readers. Sounds like fun! I just read about this on Facebook yesterday, I will definitely check it out! Will be good for you - I believe most of the flash giveaways are open to Canada, but am going to look into the sampling events as well. The is awesome and lots of awesome products. I'm ready to go. That does sound like a fun event!!! We're big fans of Riley's and Bravo! I love this idea. Have fun!!! Thanks! It should be a lot of fun :) Our first time trying both Riley's and Bravo, but we are enjoying them so far. What a fun event! Are there any cat items being given away? It is mostly dog items, but there are a couple of cat things here and there. I checked the schedule out myself earlier to check which samples the brands were giving away. I can't disclose the flash giveaways but keep your eyes peeled! Oh don't worry about it. I am so behind on my blog reading :( Trying to catch up with everyone right now. Sometimes if I delete things, they get sent to spam afterwards in the future. Am doing a weekly newsletter now too. Can sign up at the top of the page! We hope you will come by our updated post and help make a child smile...today is the final day. 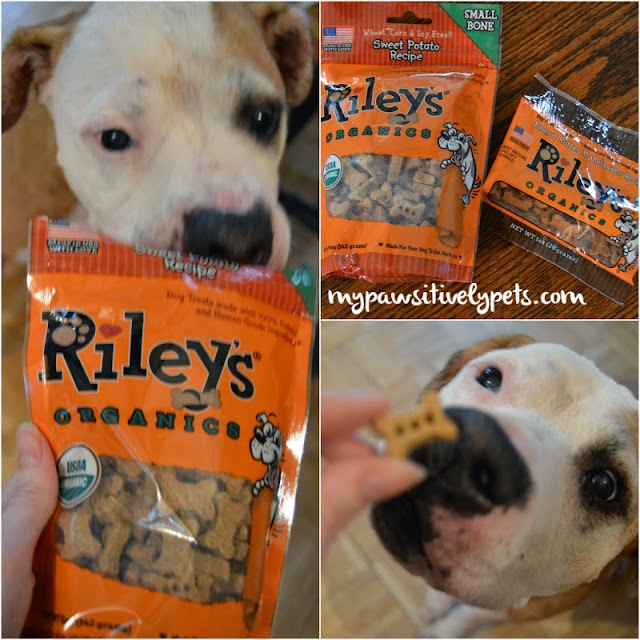 My dogs love Riley's organic treats! I'd love for them to try the dental treat. Are the dehydrated bravo meals new? We used to get Bravo Raw for Damien. Dehydrated version sound great. I'm not sure if they are new or not. They seem to be delicious though! No comprendo. Do they have any cat stuff or is it all dog. Everything I win I have to give to someone? I can't disclose the sampling events or flash giveaways, but you can register and see the calendar of events. It also includes which samples will be given away. Mostly yes, it's for dogs. One of the items is so you though. I'm going to tag you when it goes live. This is the first time I heard about this big giveaway and hope to win some of the samples for my "Willow". However, I am disappointed that you are starting this on Memorial Day which is a special day for our veterans and those serving in the military. I attend several of these events to honor and show my support for those who our defending our country and will miss many of the sample giveaways tomorrow. !.